On the 26th June Nicole was spotted out and about in LA in two different outfit changes. The first spotting was of Nicole taking Harlow out on errands. Nicole wore some serious high waisted flared jeans matched with a plain black 'tee and completed the outfit with a right on trend black and white fedora. 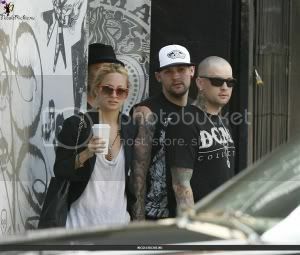 Later on that day Nicole was spotted out with her beau Joel Madden visiting his DCMA store in Los Angeles. Nicole lost the high waisted jeans and opted for some short siwy cut off shorts matched with a plain white 'tee and brought the outfit together with a fitted blazer. Which style do you prefer .. Both looks are fabulous! jeans for winter and spring, shorts for summer! I love both I think she looks good in anything .